My holiday present to myself and Ryan was to unplug completely for the week. No Twitter, no blogging, and very little Facebook. I gotta tell ya, it was a pretty nice break! But now I am so back-logged with things I need to post, I don’t even know where to start! For the sake if timeliness, I will start with Christmas. Ryan’s family has a Christmas Eve dinner tradition, where all the aunts, uncles, nieces and nephews get together for dinner, a Chinese gift exchange that everyone complains about, and a visit from the fat bearded guy himself. It is a great family tradition, and this year, for the 2nd year in a row, was held at Ryan’s sister Melissa’s house. 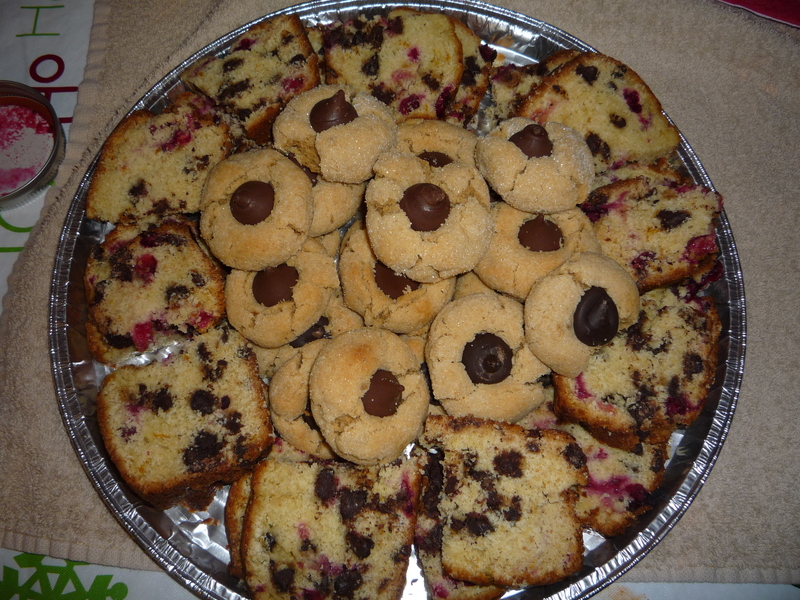 For potluck purposes, my contributions this year included a pickle and olive tray, a cheese platter, a spinach dip, a bottle of homemade whole cranberry sauce (special order for Melissa and Jimmy), a green salad and Peanut Butter Kiss cookies and Cranberry Chocolate Chip Bread. I was happy to make some garlicky dills and a batch of bread and butter pickles, which I haven’t made since I originally posted them. Man are those pickles good!! My cheese platter consisted of Cabot Cheddar (the family is a little less than adventurous when it comes to their cheese), Beekman 1802 which Jimmy ordered for me, and mozzarella, tomato and fresh basil marinated in balsamic and olive oil. 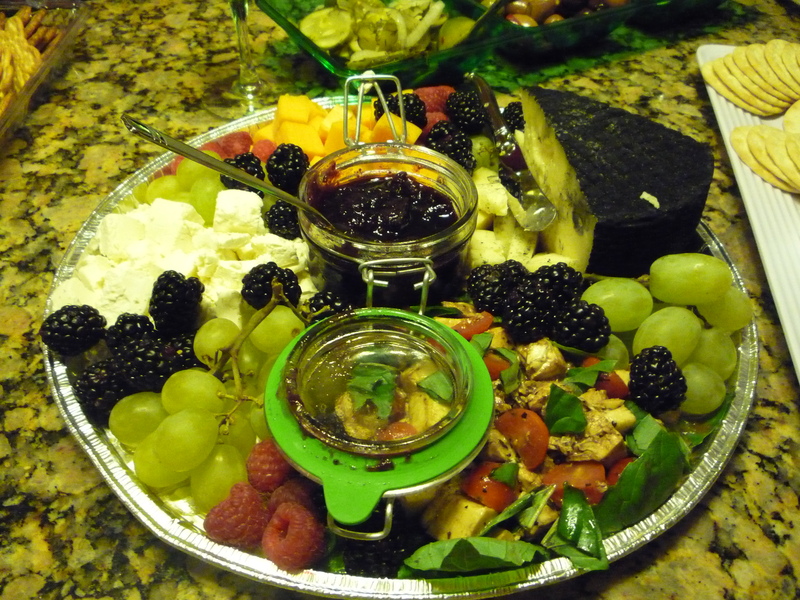 I highlighted the cheeses with grapes, razz berries, blackberries, and a fig jam my co-worker made. 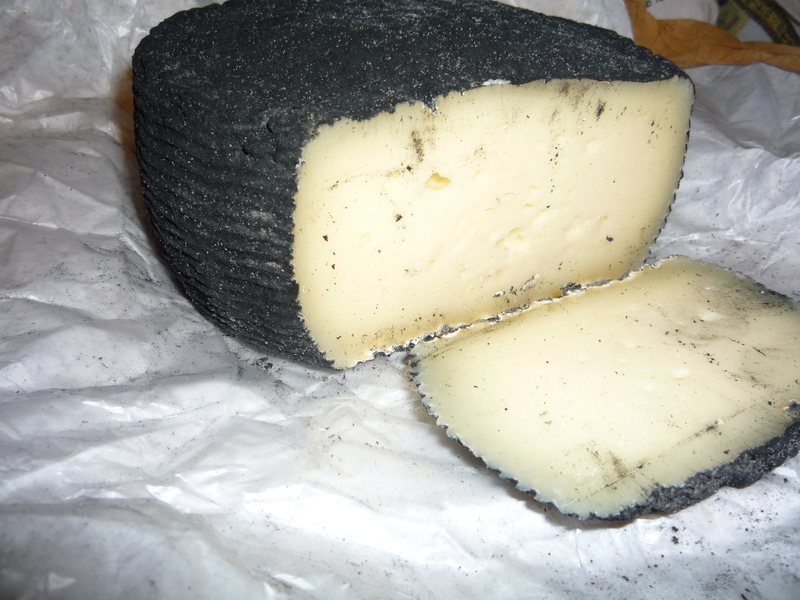 I was pleasantly surprised to see the family adventure over to try the ash encased Beekman cheese, which is fabulous! 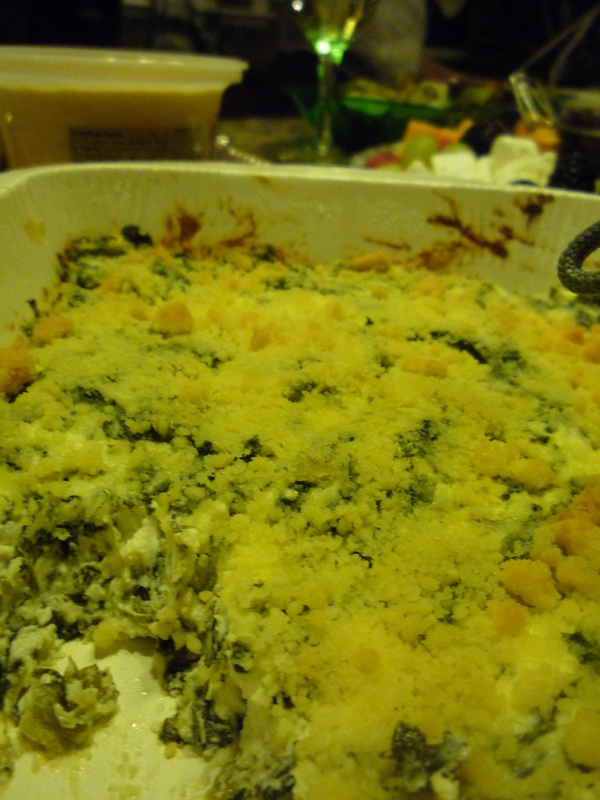 My spinach dip was good, but it was missing some creaminess. It may have needed a dollop of sour cream, or mayo, or maybe just more cream cheese. The flavor was great, however, and the roasted garlic I made for the recipe definitely shined through! These potluck meals always feel so heavy, and like they need a fresh salad to wash it all down. I have learned from experience though that you only need a little, so I downsized my usual monster salads to a medium glass bowl, and marinated it in my simple lemon salad dressing. 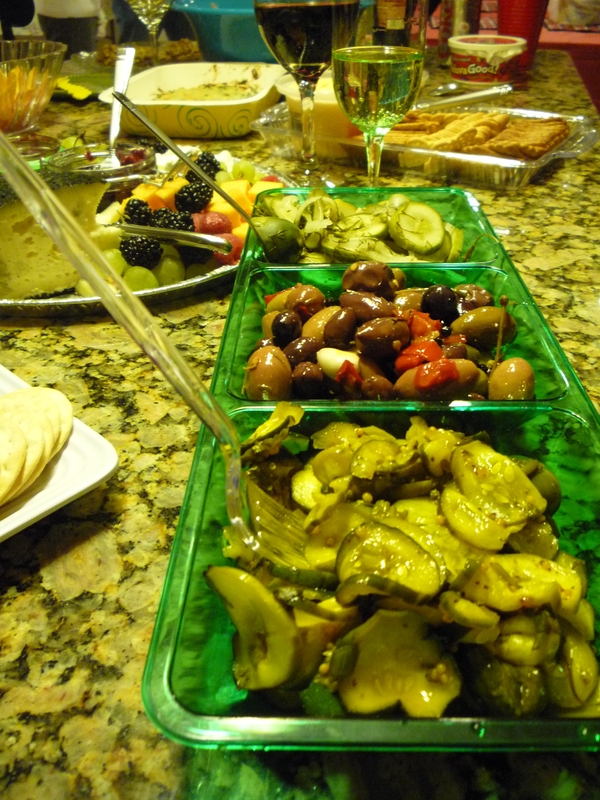 My offerings were only a small portion of the food on display that night. The highlight for me was, as always, the traditional Beaulac Meat Pies made by uncle Barry. Unfortunately I am pretty sure that Barry will NOT be writing a guest blog post, but maybe, just maybe, I can weezle the family recipe out of him! 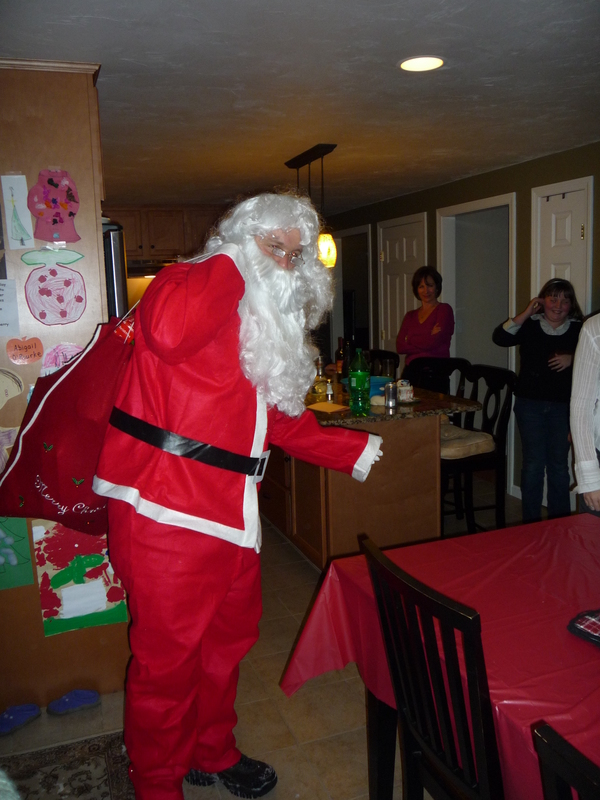 After dinner and dessert the kids ran to the back door as bells mingled and a special visitor made his way in with a giant red bag of presents! After the kids had their fun, it was the adults turn to have fun. 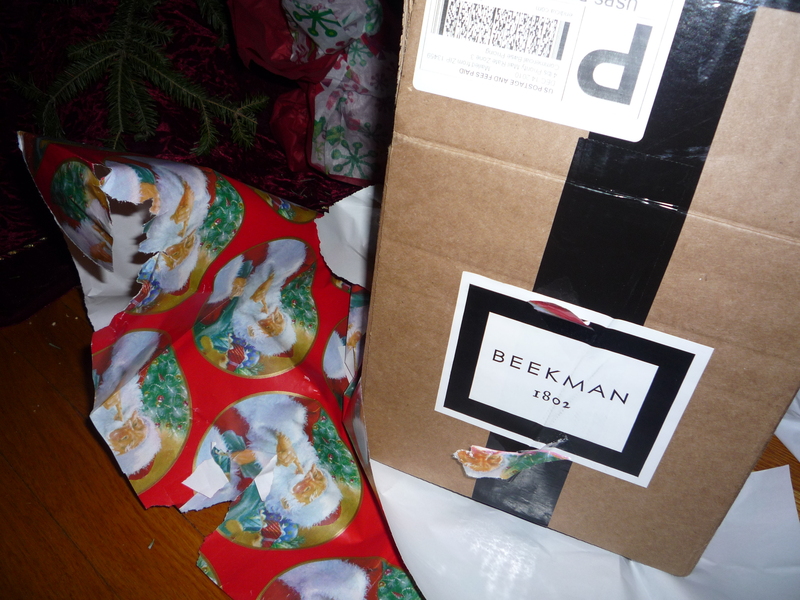 I must say that everyone stepped up their game for the gift exchange this year. It was the first year for 2 of the cousins to leave Santa’s presents behind and join the grab. The only disappointment this year was that there were only two presents stolen! I made a move for a cozy side-sleeper pillow, and Lottery tickets were (of course) also nabbed. And with that, another fabulous Christmas Eve passed. Now we are left to start planning for next year and searching for the perfect grab gift that everyone will want to steal! Oh yes, one more note. I found my new favorite champagne. It was just a touch dry, and a touch sweet. The perfect combination to be able to drink it all night! 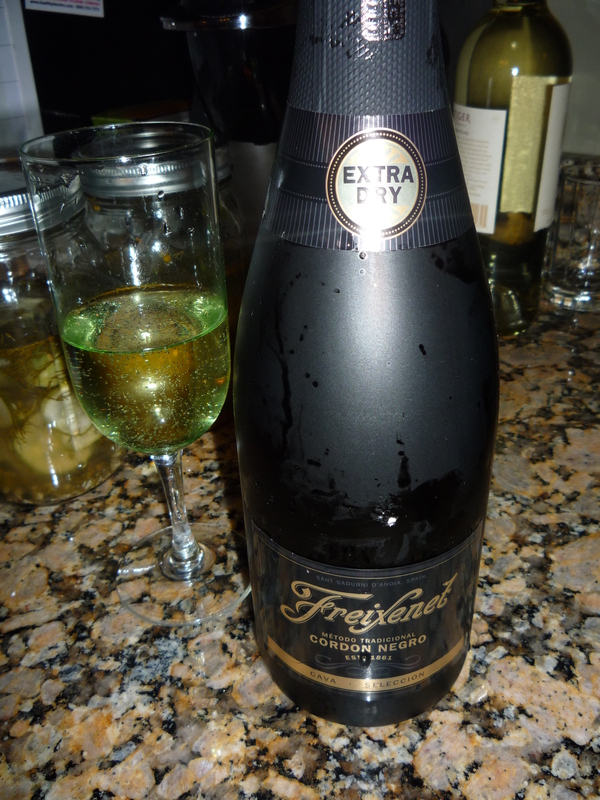 I will be revisiting my new find for New Year’s Eve, and at $11.99 for a bottle, why not! Remove bread from pan and place on cooling rack to cool completely. This entry was posted in Recipes and tagged boston, celebration, cheese, christmas, cookies, cranberry bread, food blogger, pickles, potluck by reneeh. Bookmark the permalink. Wow I wanna try that cheese! 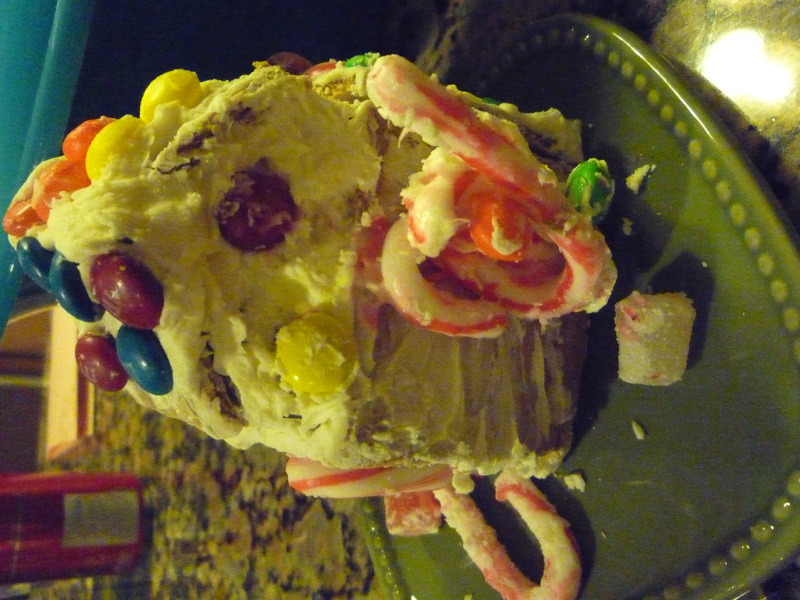 Looks like you had a fab holiday season. Happy New Year!! A social media detox can be such a good thing! I was definitely off the map and loved it. Happy New Year! That cheese looks so good! Happy New Year!! I also do a Gift Swap with BF’s fam. I made homemade caramels, cocoa and marshmallows this year. Totally worth it. Looks like it was super fun! Happy New year!